The Alaskan Muse: Does The Scarlet Letter REALLY Represent Adultery? 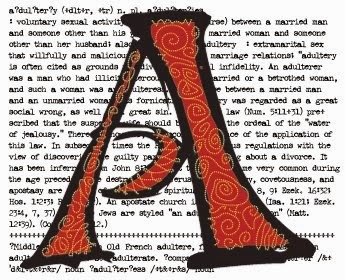 Does The Scarlet Letter REALLY Represent Adultery? My favorite book is The Scarlet Letter by Nathaniel Hawthorne and it's also my favorite love story. Oh yes, it's a love story. The Scarlet Letter is set in 17th Century New England and tells the story of Hester Prynne, a woman that is punished for adultery and forced to wear a scarlet letter 'A'. Hester's adulterous affair had produced a child, and unbeknownst to the townsfolk, the father of that child was Reverend Arthur Dimmesdale. Hawthorne is a master of symbolism and his book is filled to bursting with wisdom and insight about sin, guilt, and human nature. I read it at least once a year and each time I'm struck by new insights. Last October, I had a thought occur to me which I had never before considered: does the scarlet letter represent adultery? We know that it represents adultery for Hester's Puritan society, but is that what it means to her? Think about it: Hester wears the scarlet letter for the rest of her life—until the day she dies. There is only one time—one time—when she removes the scarlet letter. When she has a quiet rendezvous with her lover, Reverend Dimmesdale—Arthur Dimmesdale. For all of Hawthorne's intellectual prowess, I really don't believe that he simply overlooked the fact that the first name of Hester's love begins with an 'A'. Perhaps this is why Hester was willing to carry the scarlet letter with her for the rest of her life. It was a representation of how she carried Arthur close to her heart. The the last chapter of the book we find these immortal words: "Be true! Be true! Be true!" Indeed, in matters of the heart, truth is paramount. The New Mother Teresa is...a Man?